Preliminary ProceduresRemove the air inlet screen. Refer toAir Inlet Screen Replacement.Disconnect the electrical connector to the windshield wipermotor. ProcedureRemove and install the windshield wiper motor. 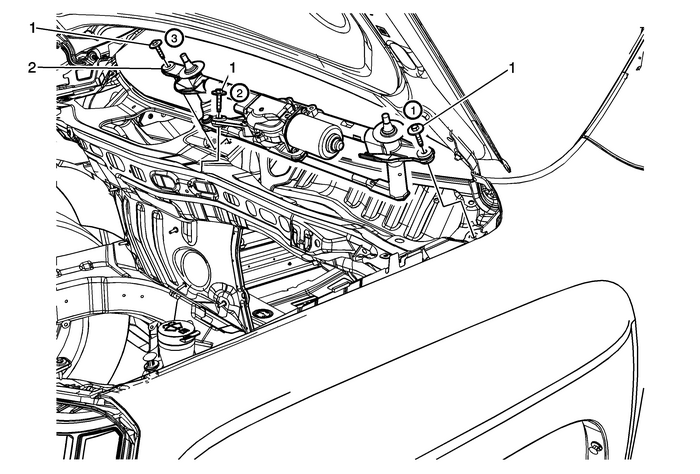 Refer toWindshield Wiper Motor Replacement.Position the transmission assembly into the plenum upperpanel.Secure the electrical connector to the windshield wipermotor.Secure the transmission to outer fender flange bolt first,followed with the other two transmission bolts, (as shown).